Safety inside the cabin has become a very high priority for customers in the Indian market today. The government has also shown keen intent to make our cars safer, by introducing new norms which all car makers have to comply with now. As a part of this update, manufacturers have to provide a bunch of safety aids including airbags and ABS as part of standard equipment on their cars. The humble Maruti Alto K10 has been revamped as part of this update and comes with a bunch of new safety features as standard. The downside to this addition, however, is a small increase in the price tag of the car, which now ranges from INR 3,65,843 to INR 4,44,777, both are ex-showroom, Delhi. With the MY2019 model, customers will get ABS with EBD, driver side airbag, a speed alert system and driver and co-driver Seat Belt Reminder as standard. These features will help the driver and occupants of the car safe. Some systems like ABS with EBD and speed alert will help prevent a mishap in the first place while airbags would protect the drivers in case of a collision. An extra cost in return for such crucial safety aids is indeed justified and Maruti seems to have tried their best to keep the price hike as minimum as possible. 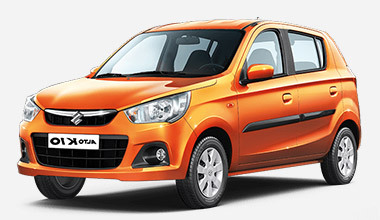 It is interesting to note that the Alto 800 is yet to receive any such update, yet. In other news, the manufacturer has cut down production across all its factories in India by almost 21 %. According to the manufacturers’ regulatory filings, the factories produced 1,36,201 units in March this year. Compared to the 1,72,195 units it produced in March 2018, this represents a drop of around 20.9%. Maybe this is why the manufacturer is now making changes to its popular car models like the Ciaz, Ertiga, Ignis, Eeco and now the Alto K10. While Maruti fights this change and decline in their sales in our market, stay tuned for more news from the leading Indian car manufacturer.